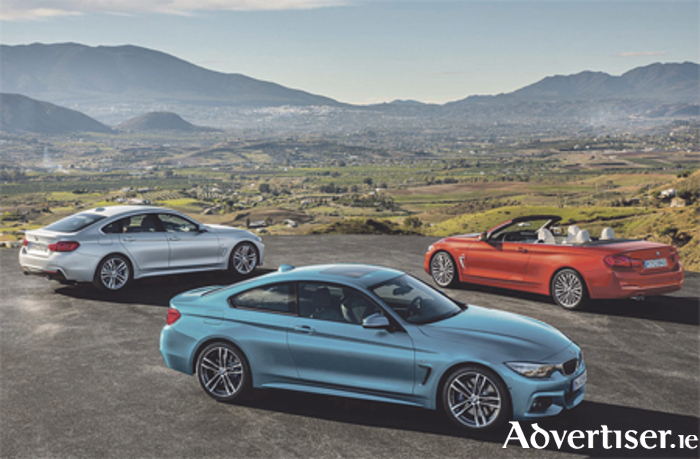 The BMW 4 Series Coupé, BMW 4 Series Convertible and BMW 4 Series Gran Coupé have received refreshed styling, upgraded cabins and new interior features. Styling cues borrowed from the spectacular BMW Concept 4 Series Coupé in 2012 are clearly visible in the design of the new BMW 4 Series, with the new models including elements such as a large air intake with eye-catching bars and LED headlights and rear lights. The restyled front end of the BMW 4 Series expresses the model range’s dynamic personality to great effect. The defining feature at the front is an unbroken central air intake with an aperture that increases in size towards the outer edges, adding a more imposing presence and greater sense of width to the entire nose section. The BMW 4 Series Coupé, BMW 4 Series Convertible and BMW 4 Series Gran Coupé are now equipped with twin LED headlights as standard. LED front fog lamps also form part of the standard specification. Additionally, all models in the new BMW 4 Series are optionally available with new Icon Adaptive LED headlights. The rear of the BMW 4 Series has a low, sporty look that follows the lead of the front-end styling, with the bold horizontal lines and elongated design of the rear light clusters helping to make the muscular wheel arches stand out. The re-designed rear lights give the new BMW 4 Series a fresh and technically sophisticated appearance from the rear. The characteristic L-shaped styling theme for the lights has been retained, but in a reinterpreted form. The LED lights are no longer divided into individual light strips, with a sweeping curve in the outer section of the light assemblies giving them a perfectly homogenous look. BMW says that the driving experience in all BMW 4 Series models is rooted in a finely honed blend of sharp sporting performance and superb ride comfort. The BMW 4 Series has a lower centre of gravity than the 3 Series, a wider track at the front and rear, plus specially configured kinematics, giving it all the ingredients needed for even more agile handling. All of the petrol engines and the four-cylinder diesel powerplants offered hail from the latest BMW Efficient Dynamics family and are equipped with BMW TwinPower Turbo technology. All new BMW 4 Series models are available with three petrol engines offering the following power ratings: the 420i with 184hp, the 430i with 252hp and the top-of-the-range 440i with 326hp. There is also a choice of three diesel engines: the 420d with 190hp, 430d with 258hp and 435d xDrive with 313hp. Combined fuel consumption ranges from 47.9mpg to 70.6mpg, with CO2 emissions of 106-155g/km. The BMW M4 Coupé and BMW M4 Convertible represent the epitome of a high-performance sports car. The six-cylinder engine with M TwinPower Turbo technology is fitted as standard under the bonnet of both BMW M4 model versions, generating a mighty 431hp. The BMW M4 Coupé now comes as standard with LED headlights, the Icon Adaptive LED headlights with hexagonal graphics being optionally available. New 3D LED rear lights also freshen up appearances and add technical appeal. The BMW M3 Saloon also gets this headlight upgrade from March, 2017. There is no better time to purchase your new BMW 4 Series. Colm Quinn is offering a €5,000 discount on new for 171 BMW 4 Series models. Terms and conditions apply. The car must be purchased and delivered before March 21, 2017.